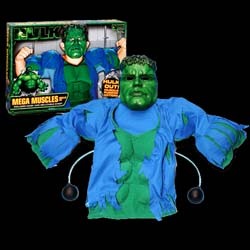 The Hulk Mega Muscles Dress-Up Set is great for the little monster in the family. It's only a matter of time before some lefty do-good group comes out and declares The Hulk as unfit viewing for children - provoking violence between kids. So how do the toys fare? Would our little band of child guinea pigs become unruly and start beating the living daylights out of each other? Or would they play nicely? Happily, all of the children were extremely considerate of each other while playing with this toy - and what a fantastically entertaining product it is too. Not once did anyone run amok bashing the living daylights out of anyone else. Our reviewers, bless 'em, ranged from 4 up to 12 and they were all truly captivated by the way they could inflate their arms and chests - well the boys were more interested than the girls. It almost made me wish I was a few dress sizes smaller - and several feet shorter - so that I could squeeze into this and have a go. So how does it work? Well, you put the shirt on like a normal T-shirt and then squeeze two air-pumps (included) in order to inflate the arms and chest. And as they inflate, to give the appearance of rippling muscles, the shirt appears to tear. With the Hulk movie still to be released at cinemas, Toy Biz's range of official merchandise is slowly making it's way onto the market. In the UK the range is being distributed by Vivid Imaginations. Who cares whether the movie is any good when the kiddie merchandise we have seen in the office so far is worthy of winning an award? The only real down side is that the Hulk face mask is not as good as it could have been. Apart from that this is a fantastic toy.